I filled every second of the next few days with some kind of experiment. How long—when, where, anything I could think of to test my limits and my control. I figured that the sooner I knew what I was up against, the better off I’d be. Well, no, it was my own super ability. It was the type of thing that was more like a curse than a help. I didn’t know what to do with it. Other than a few larks or maybe a prank or two, what good was it? Not to mention that the spontaneous age shifts, the ones I couldn’t seem to do anything about—were becoming a problem, more and more so as I went along. I’d figured out the warning signs. The twinge in my fingers was the most obvious one. There were a few others. Some of them weren’t always there. They came and went, but the twinges were always the same. I didn’t think that I’d ever like that feeling. If it came, I knew to run and find some place to stay until I knew it was okay to come out. Needless to say, my life now consisted of never being very far from a bathroom or closet. Clayton scouted the restaurant. He was only here to get some take out, but he didn’t dare not make sure that the public restrooms were open, no matter what. He also didn’t dare go to the same places twice. He would never get to be a regular anywhere again. It was just not going to happen. If he was a regular, he was that creepy guy with the bladder problem or explosive diarrhea or something. That must be what they thought when he ran off in the middle of an order and didn’t come out of the bathroom for twenty minutes. His life was shaping up to be one humiliation after another, and that… it wasn’t really that unusual, he knew, but he just didn’t understand why he’d had to end up like this. How had he gotten this ability, anyway? He knew he couldn’t have come by it from any kind of… toxic spill or radioactive spider, his nasty leaking toilet thing aside. Radioactive spiders would really just kill you, not turn you into Spiderman. 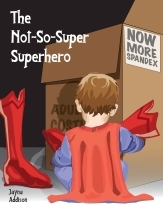 He hadn’t trained himself into a hero with special gadgets like Batman or a few of the other lesser known superheroes. He wasn’t the son of some god or heir to any kind of kingdom or secret identity that was passed down through a family line. He hadn’t volunteered to participate in a test of a super drug designed to make humans better or built himself some kind of rocket suit. He hadn’t found a ring with magical powers. He wasn’t some kind of genius who had done this to himself. Clayton was probably something close to a mutant. That made the most sense. He could possibly still be an alien. It was hard to say. It might be easier to go back to the possibility—the near certainty of the fact that he was just crazy. He couldn’t do any of the stuff he thought he could do. He wasn’t shifting ages. He was just imagining things. He was having one hallucination after another, and they were… great. They were wonderful. Apparently, he was a sadist bent on torturing himself. That made him a masochist, too, but then again… He didn’t really think he wanted to be like this or wanted any of this humiliation. He couldn’t. Even if he completely hated himself—and he didn’t—he wouldn’t be this cruel. So… Maybe he just needed to blame it on his parents. The ones that he’d never met. He’d been in the foster system all of his life, and he knew that the records they had of his parents were pretty much nonexistent. He must have been one of those babies found in a dumpster or some church steps—though he was thinking it had to be the dumpster, really, given his luck. He was a little over average intelligence—though he was starting to think that was more of a failure on the part of the public school system than an actual mark of genius on his part. He was just there. He was so ordinary it was pathetic. He had a dead end job—king of the file archive was no real achievement—and though he’d like to think he was destined for and capable of great things, he kept coming back to the plain fact that he might have been smart enough to finish high school early but not to do anything beyond that. He was not going to change the world. This ability didn’t make him any better than anyone else. So far, from what he could tell, he was a lot worse off than some people. They might be bored. They might hate their lives. They might not have great jobs. They might not have much money. He had all of that—and he randomly turned into a different age. No reason, no rhyme, he just did. Clay sighed. A few years back, and he’d probably have gone off to join the circus, making a living being a “freak.” Now, of course, he couldn’t call himself that, couldn’t call anyone that. So he had a genetic fluke that made him different—or he was an alien, sent to earth alone to scare its inhabitants by randomly becoming another age. His ability wasn’t even scary. He was probably as intimidating as a mouse. “Just give me the regular so I can go,” Clay muttered, handing her his credit card. She swiped it, and he rubbed his forehead. He had to go home again before he completely lost it. He’d never really cared before, and he didn’t have the money for it, either, but maybe it was time to look into who his parents really were. And if they were the reason that he was the way he was.